I first made this tart (or quiche, though I have noticed that men don’t like eating quiches, though they don’t mind tarts!) for a ‘plein air’ day at my landscape painting class. It was a huge success, and I had to print out twelve copies of the recipe. It appears below exactly as I typed it. The cheese references are for the people who hadn’t a clue what goat’s cheese was and firmly believed that Parmesan was smelly grated cheese that came in a green shaker! 1 x savoury shortcrust pastry base, frozen then baked blind in a 25cm diameter x 3.5cm deep flan tin with a removable base or a pate brisee base. Heat olive oil and butter in a heavy-based frying pan until the butter sizzles. Reduce heat and add the finely sliced leeks. Stir so that they don’t catch and continue to cook until leeks are transparent and tender. Remove from heat and place in a colander or sieve to drain well. Preheat the oven to 200C, or a little hotter. Sprinkle about one third of the Parmesan cheese evenly onto the tart base, then add the leeks, making sure they cover the base, right to the edges. Add some of the thyme leaves. Slice or crumble (depending its consistency – see note below) the goats’ cheese and distribute it evenly, then top with the remaining Parmesan cheese and the remaining thyme. cups of cream and beat together lightly. (Hold the remaining egg and cream until you know if you need them.) Add a little freshly grated nutmeg, then pour the mixture carefully into the tart, taking care not to overfill. If you don’t have enough egg/cream mixture, beat together the remaining egg and cream and add. Bake at 200C for 20 – 25 minutes, or until the top is a nice golden colour or the quiche is set. This sounds absolutely wonderful! Sounds perfect for a Sunday lunch or brunch. It is yummy. 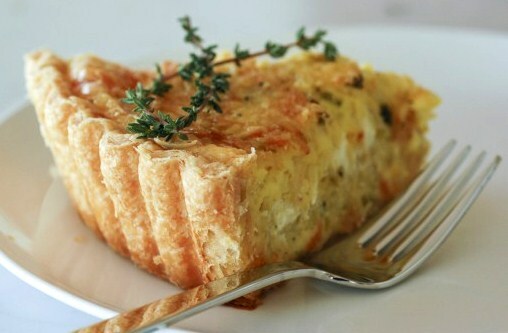 I will post another awesome quiche/tart today. thanks for stopping by! Your tart sounds great. Happy that I stopped by today. This is my favourite sort of lunchtime food. Thanks! This is made using pate brisee recipe (an older post) not the store bought one. If you make it yourself please send me a pic! Thanks for commenting. Looks prety and tastes delicious! I’ve never done it with the pre-bought shortcrust pastry, only with the Pate Brisee pastry recipe that you’ll find in an earlier post. Mum rarely used a bought pastry crust – I don’t know maybe she was just short of time when she first made this. If you make it – please send me a photo and I will post it.